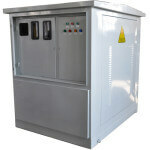 Prepaid metering box series applies to 6,10kV power grid for energy measurement. Achieving automatic fee -power on, no fee-power off. 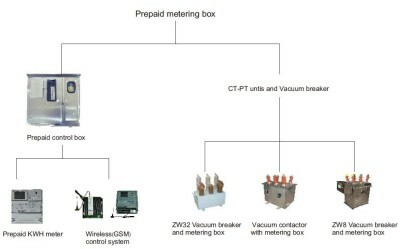 This prepaid metering box system helps electric power companies manage user, charge for electricity easy and anti-power-stealing to avoid loss of power. 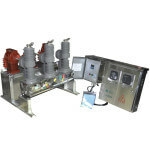 System made up from three main parts: vacuum switch, combination transformer, control box. 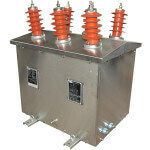 Combined transformer has two types: three-phase three-wire,three-phase four-wire, also according to user requirements, add two more winding for over current protection, zero-sequence protection. 1 Switch for permanent magnetic vacuum contactor in a submerged structure. Products brought up by permanent magnetic vacuum contactor and over current protection, combination transformer zero-sequence protection, assembled together, combined transformer can be made into single ratio, dual variable-ratio, three changes of ratio. Features: suitable for low current, vacuum contactor breaking flexibility, mechanical structure simple and stable operation, compact structure, small volume, light weight, easy to install, cost-effective product promotion. 2 Switch for the vacuum circuit breaker with integrated structure. 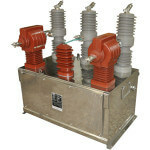 Combined transformer ZW8 or ZW32 assembled a body of vacuum circuit breaker, combined transformer with overload protection and zero-sequence protection of winding, to change the traditional switch structure, optimize the over current protection function. 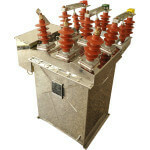 Features: suitable for large currents, high breaking capacity, integrated design is easy to install. 3 Switch for vacuum circuit breakers split type. Zw8 or combination of ZW32 vacuum circuit breaker and transformer is an independent structure, assembled together to achieve prepayment features when installing. To select the combined transformer with overload protection and zero-sequence protection of winding, to change the traditional switch structure, optimize the over current protection function. Features: suitable for large currents, high breaking capacity, installation flexibility, split body structure, easy to replace damaged parts, reducing maintenance costs.